Lady beetles, ladybugs, ladybird beetles or whatever you can them, are one of the most beneficial insects in the garden. The process of getting to be an adult ladybug is somewhat convoluted and requires a four stage life cycle process known as complete metamorphosis. Because you want to encourage ladybugs in the garden, it’s good to know what ladybug eggs look like as well as familiarize yourself with ladybug larvae identification so you don’t accidently do away with one. 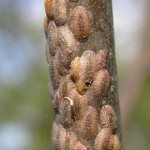 The first stage in becoming a ladybug is the egg stage, so let’s absorb a little ladybug egg information. Once the female has mated, she lays between 10-50 eggs on a plant that has plenty of food for her children to eat once hatched, usually a plant infested with aphids, scaleor mealybugs. Over the course of the spring and early summer, one female ladybug can lay up to 1,000 eggs. Some scientists think that ladybugs lay both fertile and infertile eggs within the cluster. The supposition is that if food (aphids) is in limited supply, the young larvae can feed on the infertile eggs. What do ladybug eggs look like? There are many different species of ladybug and their eggs look slightly different. They may be pale-yellow to almost white to a bright orange/red in color. They are always taller than they are wide and clustered tightly together. Some are so tiny you can barely make them out but most are around 1 mm. in height. They may be found on the undersides of leaves or even on flower pots. You may have seen the larvae of ladybugs and either wondered what they were or assumed (incorrectly) that anything that looks like that has got to be a bad guy. It’s true that the larvae of ladybugs look rather fearsome. The best description is that they look like tiny alligators with elongated bodies and armored exoskeletons. While they are completely harmless to you and to your garden, ladybug larvae are voracious predators. A single larva can eat dozens of aphids per day and eat other soft-bodied garden pests as well such as scale, adelgids, mites and other insect eggs. In an eating frenzy, they might even eat other ladybug eggs too. When first hatched, the larva is in its first instar and feeds until it is too big for its exoskeleton, at which time it molts – and will usually molt a total of four times before pupating. When the larva is ready to pupate, it attaches itself to a leaf or other surface. The larvae pupate and emerge as adults in between 3-12 days (depending upon the species and environmental variables, and thus begins another cycle of ladybugs in the garden.